Police have fired tear gas and rubber bullets to disperse striking workers close to the Marikana platinum mine, west of the capital Pretoria. It was the latest stage of a crackdown that saw them launch early-morning raids on miners' shacks, taking machetes, spears and other weapons. The government has vowed to clamp down on illegal strike action in gold and platinum mines. 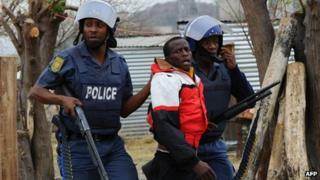 Action has spread since police killed 34 miners at Marikana on 16 August. On Friday, the cabinet announced it would not tolerate what it called illegal gatherings, and threatened to disarm strikers. Men, women and children scattered as police backed by an army helicopter fired rubber bullets and tear gas at striking workers in a field in Marikana on Saturday morning, according to reports. Television images showed people with bloody wounds. "A police nyala [armoured truck] drove past us, we were a group of women and others ran away. I just stood there watching and they shot me in my leg," Melita Ramasedi told Sapa news agency. As police moved in, residents at the local Wonderkop shantytown set up barricades of burning tyres to try to block police access to their neighbourhood, reports said. Earlier, some 500 police officers took part in early-morning raids on the workers' shacks, seizing machetes, spears and other weapons, police spokesman Thulani Ngubane said. He told AFP news agency the police had made 12 arrests - though five of Saturday morning's arrests were related to possession of drugs and not weapons, police said. "Wherever we see this unruly behaviour and people taking the law into their hands by embarking on unprotected gatherings and illegal gatherings, we are definitely going to act," he said. "The police are not going to hesitate to act. We are going to act as we have started acting and we are going to continue doing that." The strike has seen hundreds of protesting workers brandishing sticks and machetes march from mine to mine around Marikana and other areas, threatening anyone reporting for work. Miners have demanded their pay be increased to 12,500 rand a month (£930; $1,500) from the current 4,000-5,000. On Friday they rejected an offer by the owners, Lonmin, for an extra 1,000 rand a month, saying it was an insult. Since August's deaths at the Marikana mines, industrial action has spread to other gold and platinum shafts in South Africa's lucrative mining sector. Seven protesters were arrested at an Aquarius Platinum Limited mine on Friday shortly after the clampdown was announced, AFP reported. Finance Minister Pravin Gordhan has warned that strikes could hurt economic growth, jobs and investor confidence in Africa's biggest economy. Some unions have threatened to call a general strike. Viewpoint: Will anger boil over?